FCA US LLC is pleased to announce a special $500 cash allowance toward the purchase or lease of many of the most popular vehicles in our lineup. Between the Chrysler, Dodge, Jeep® and Ram lineup and the FIAT® 500L, there’s something for everyone. NAHB members and their employees can combine this stackable $500 cash allowance with most current retail incentives and choose an On The Job program allowance. Plus, same household family members receive a $500 cash allowance, stackable with most local and national retail incentives, toward the purchase or lease of a vehicle. NAHB member business owners and their employees also receive On The Job program benefits. 3.Inform the dealer and provide proof that you are a NAHB member, or you are employed by or an immediate family member of a NAHB member to receive an additional NAHB $500 Member cash allowance. 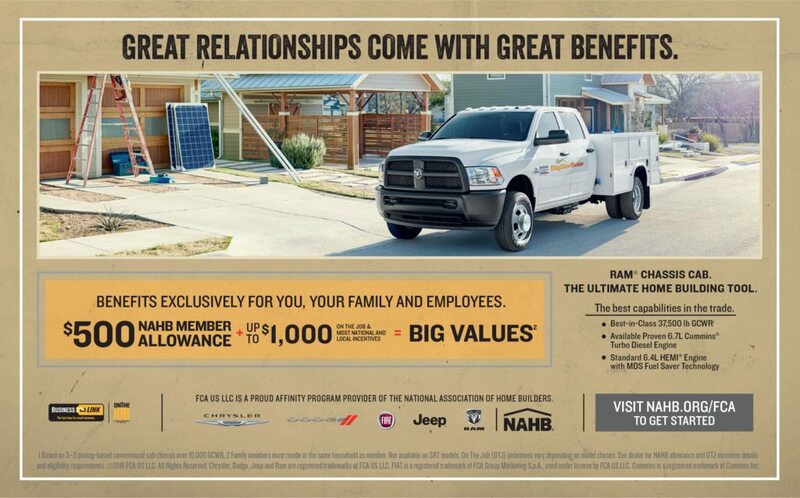 Simply use the “Print my Proof of Membership” link to login to your NAHB account and take that form to the dealership. If you haven’t registered for your account on NAHB.org please contact Elizabeth Carpenter for your pin at RIBA 401.438.7400. This offer is available to eligible current National Association of Home Builders (NAHB) members, their owners and employees, and eligible family members residing in the same household. This offer provides a $500 cash allowance towards the commercial purchase or lease of select new 2016 Chrysler, Dodge, Jeep, Ram and FIAT vehicles that are delivered by 01/02/2017 and is not valid on prior purchases. On The Job (OTJ) incentives vary depending on model of commercial truck chosen and are not available to family members. See dealer for allowance and OTJ incentive details and eligibility requirements. ©2016 FCA US LLC. All Rights Reserved. Chrysler, Dodge, Jeep and Ram are registered trademarks of FCA US LLC. FIAT is a registered trademark of FCA Group Marketing S.p.A., used under license by FCA US LLC.